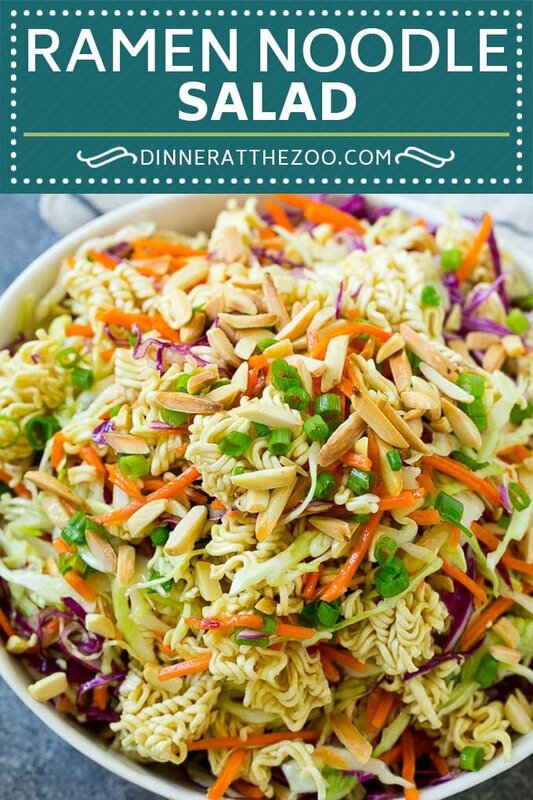 This hearty ramen noodle salad is full of cabbage, carrots, crunchy ramen noodles, green onions and almonds, all tossed in an oriental dressing. The perfect make-ahead salad to feed a crowd. 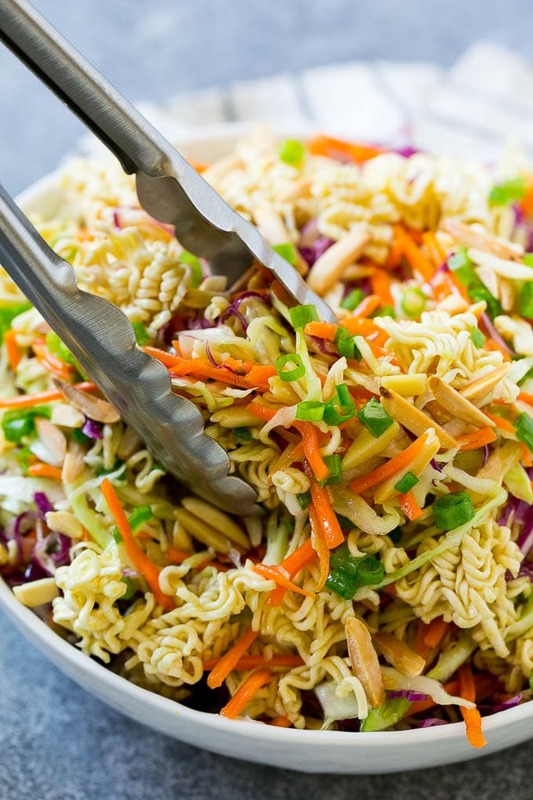 Ramen noodle salad is a classic dish that’s a welcome addition to any party. It’s simple to put together and people always beg me for the recipe! In my opinion, the best salads have a variety of flavors, colors and textures. 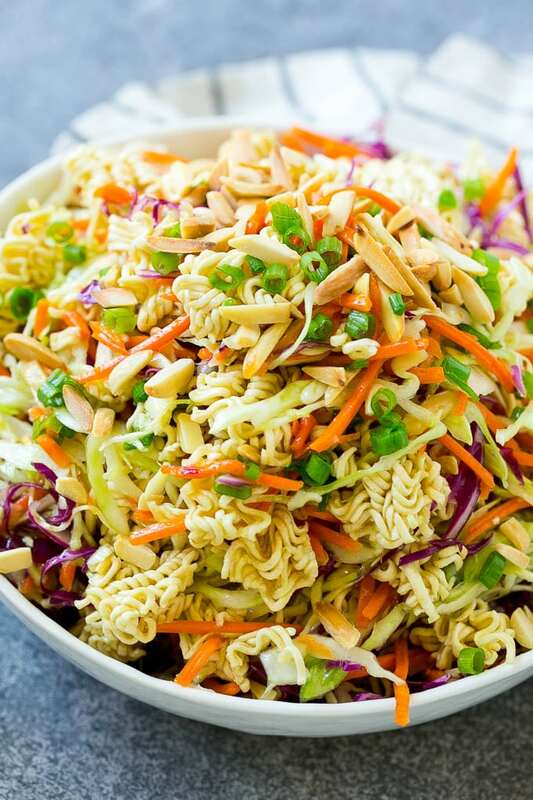 This ramen noodle salad, for example, has the perfect mix of textures due to the almonds and ramen noodles. Those crunchy ramen noodles mixing with the fresh and snappy vegetables make for the perfect side dish. 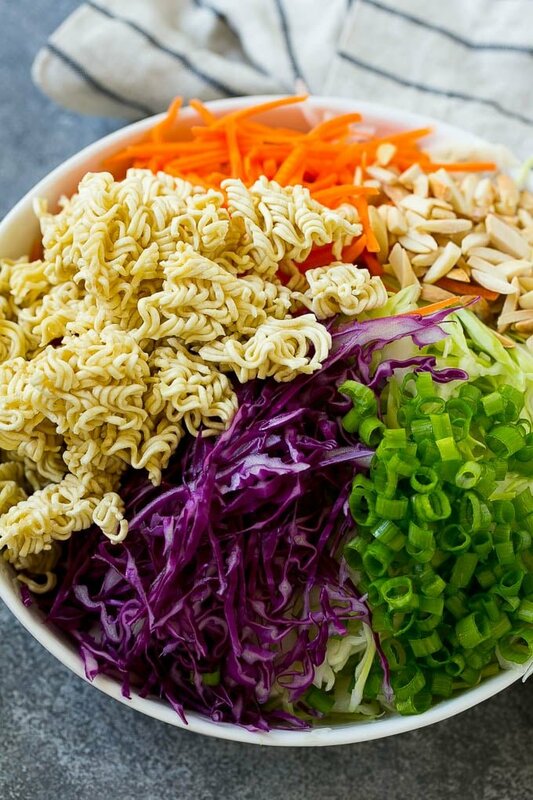 HOW DO YOU MAKE RAMEN NOODLE SALAD? 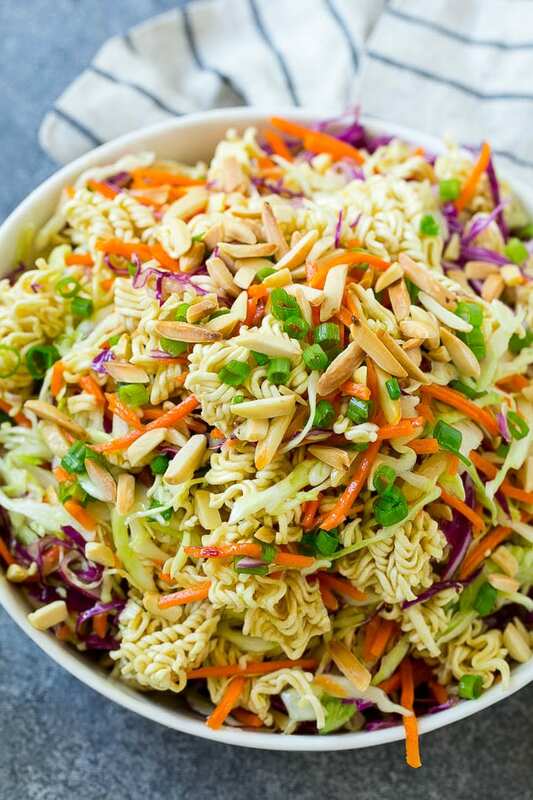 To make ramen noodle salad, you’ll put fresh carrots, shredded cabbage, green onion, ramen noodles, and almonds in a bowl. I use both purple and green cabbage because it looks so much more appealing with all the bright colors. Next, whisk together a sweet and tangy mixture of vegetable oil, rice vinegar, sugar, and the seasoning packets from your ramen noodles. Pour the dressing over your veggies, toss to mix well, and you’ve got the perfect side dish! If you don’t want to chop up your own cabbage and carrots, I don’t blame you! Feel free to grab a bag of pre-shredded carrots and a bag of coleslaw mix to make life easier. This saves a ton of time on prep work which is great if you want to toss this salad together in a hurry. 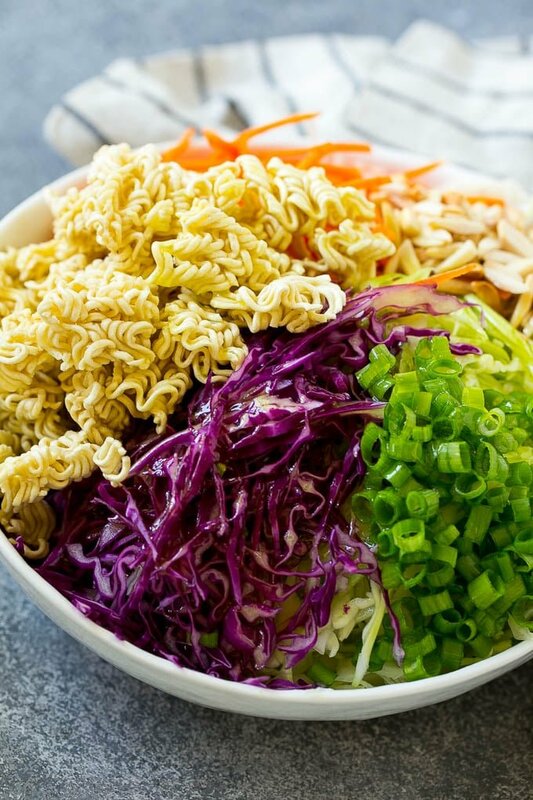 One of the perks of this oriental ramen noodle salad is being able to easily adjust the flavor without changing up the ingredients. I like to use chicken flavored ramen noodles but you can use any flavor you would like. If you don’t have green onions on hand, cilantro is a great substitute. Sometimes I like to add other ingredients to this salad like thinly sliced snow peas or red bell pepper. I’ve even seen ramen noodle salad made with sunflower seeds instead of almonds. ARE RAMEN NOODLES HEALTHY FOR YOU? Ramen noodles aren’t the healthiest option when it comes to food. They’re often fried in oil and the seasoning packets can be high in sodium. However, they have a great crunch to them that adds so much flavor and texture to any salad. The ramen noodles straight from the package are pleasantly crunchy, but will soften a bit when tossed with the dressing. CAN RAMEN NOODLE SALAD BE A MAIN DISH? Most dishes can be transformed into a full dinner. Salads are the best for this because they’re already full of veggies. 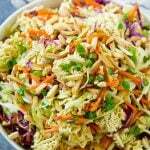 To make this ramen noodle cabbage salad a main course, you can add grilled chicken, shrimp, or even cubes of tofu. There’s nothing more satisfying than a good salad on a hot day. They’re so refreshing and contain all the best nutrients your body needs to keep pushing through the summer. I make this salad often and have no doubt I’ll be making it again soon! Place the cabbages, carrots, ramen noodles, green onions and almonds in a large bowl. In a small bowl, whisk together the vegetable oil, rice vinegar, sugar and ramen noodle seasoning packets. Pour the dressing over the cabbage mixture and toss to coat evenly. Serve immediately, or cover and store in the fridge for up to 8 hours before serving.